Using a blender prepare a sauce from the strawberries (add sugar to taste). Next use a Spaghetti Ice Cream Maker (go to spaghettiicecream.com to find the product) to shape your vanilla ice cream and place it into a chilled bowl or plate and then decorate with strawberry sauce and white chocolate sprinkles, nuts, or coconut flakes. Hmm, yummy! 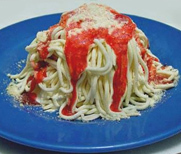 Spaghetti Ice Cream!